Part of trying to heal is apparently doing things that previously brought me joy, and blogging is one of those things, so I am going to try and get back into it. There is also something that I find immensely soothing about blogging, and it allows me to focus and think about something else without being too strenuous for my exhausted brain. 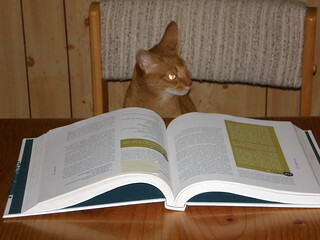 So I am going to start trying to blog regularly again. After all, my backlog of photos from cookbooks and eating out isn't going to keep working through itself. People who know me know that I can't resist a menu! This is the spring dinner menu from Blissful Bites (not to be confused with Blissful Basil from my last post) by Christy Morgan. You can see other things that I have made from this cookbook here. 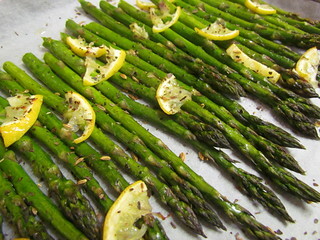 Lemon-Roasted Asparagus: I love roasted asparagus, I think it is the nicest way to have asparagus. This comes together very quickly, and it turns out that lemon roasts beautifully as well. I had to use dried oregano in the herb blend, as I didn't have any fresh. Brown Rice: Boiled Method: I normally make rice in the rice cooker, no shame. It is easy and frees up another hotplate on the stove. 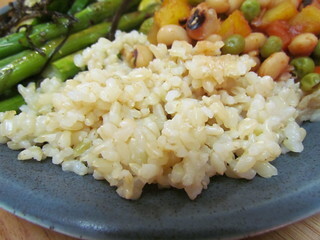 Christy has you soak the rice (medium or short-grain) for several hours before cooking. I needed to add extra water above what she mentions so that it didn't dry out mid-cook. Her version takes 45 minutes of covered simmering. 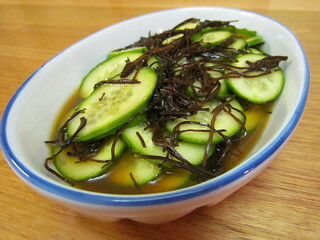 She recommends using kombu or salt, and I used salt. Orange-'Wakame' Cucumber Salad: So I was convinced I had all the ingredients for this, only to then find at the last minute that I didn't have wakame. So I used arame instead. This is a very light and refreshing salad, that has a nice sweet, salty and vinegar dressing. 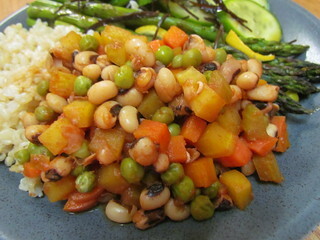 Black-Eyed Pea BBQ Stew: I skipped the first step of this recipe, which involves cooking the beans, as I had some pre-cooked beans in my freezer. I used 2 cups worth. I needed to add a little extra water to simmer the beans and veggies. Once you have cooked beans, this stew comes together so easily, and very quickly. And here is the whole menu on a plate. This worked beautifully as a complete meal, everything tasted so nice together. This little girl is keeping me going. I mentioned previously that Dim Sim is very happy to finally get to be an only cat. Spending time together and redefining our relationship in a one-on-one capacity has been very sweet, though heartbreaking for me. I often take part in a monthly vegan cook along club on Instagram (#vegancookalong), where we all cook from the same cookbook (normally something newly or recently released) and share photos of what we make. Last month, the book was Blissful Basil by Ashley Melillo. I had never read Ashley's blog prior to getting this book. It took me a little bit to warm up to this book, but once I did I fell in love hard. I have made so many things from it. There is a whole range of mostly healthy recipes, from breakfasts and smoothies, to snacks, salads, soups, sandwiches, bowls, pasta and vegetable mains, and of course some tasty desserts. This is just some of what I have made. Blueberry Breakfast Ice Cream with Pecan Streusel: This creamy, sweet and refreshing breakfast was nice and thick (I made it in my blender and had to add a few splashes of oat milk to get it smooth, in a food processor it might have been even thicken). While not fooling me into thinking it was ice cream, it certainly was a good start to the day. The pecan streusel was a nice touch (I used brown sugar instead of coconut sugar). 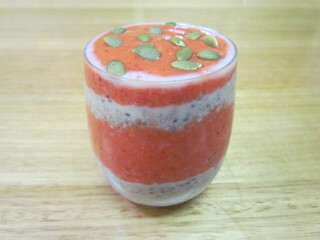 Get Glowing Strawberry-Mango Chia Pudding: I made a half recipe of this, which I found made one and a half serves (a whole recipe serves 4 according to the book). Due to availability, I used frozen mango and strawberry that I defrosted. It was a pretty filling start to the day. The remaining half serve I had left over kept for a couple of days in the fridge really well (I just stirred the remaining puree through the chia mix). 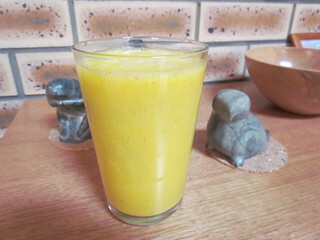 Electric Turmeric-Lemonade Smoothie: I am drawn to all things turmeric at the moment, so this was the first recipe I tried from the smoothie chapter. I used frozen mango and grapes (I like my smoothies thick and cold), so I added a few extra splashes of coconut water to help it blend. The recipe calls for 1-2 dates, I just used one small one. I could definitely taste the turmeric in this, but it was in a pleasant way. Dreamy Vanilla Tahini Breakfast Shake: This smoothie is creamy and sweet enough to be a milkshake, but is all good for you. 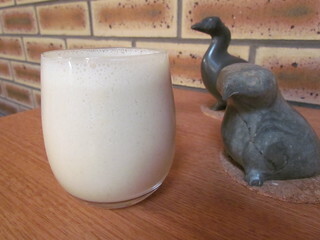 It has a sweet banana flavour, the tahini is not too strong, and there was something very comforting about it. I only used one date to sweeten it, rather than two. Some people who made it with two dates said it was too sweet, so consider cutting down. 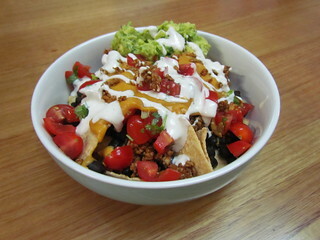 Pile 'Em High Epic Plant-Powered Nachos: These nachos call for a few make ahead recipes, as well as a few extra components in the main recipe itself. The make ahead recipes are Yellow Split Pea Nacho Cheese (see the next recipe after this one), Cashew Sour Cream (very easy to make) and Sunflower Taco Crumbles (quite salty on their own, but they meld well with other flavours). The recipe also has you make a quick pico de gallo (I left out the raw onion) and a speedy guacamole. Grab a tin of black beans and layer it all onto tortilla strips! They live up to their epic name. There is also the option of adding some Quick Pickled Jalapenos, but I skipped these. 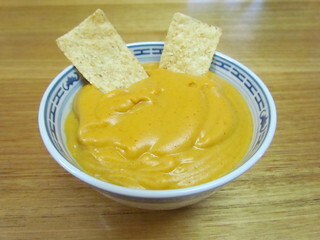 Yellow Split Pea Nacho Cheese: This recipe is used on the nachos above, but you could use it for so much more. Or just dip chips in and eat it. Or just use a spoon and eat it. Or just drink it straight from the pot. It is that good! A mix of yellow split peas and potato form the creamy base, no cashews in sight if you can't have nuts. I used garlic powder rather than fresh garlic here, and I replaced the roasted red peppers with 1 TBS of tomato paste. This is so delicious! 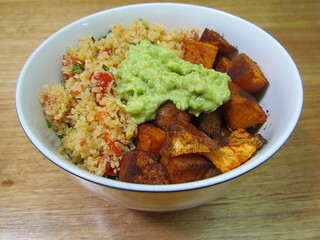 The Classic Bowl: Spicy Cauliflower Rice, Roasted Sweet Potatoes & Avocado Mash: This is a nice combination of flavours, especially when served over some baby spinach. 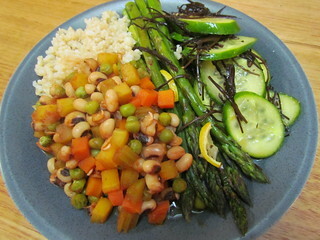 I had planned to add some warmed kidney beans as well for extra protein, but I wasn't very hungry when I made this. This was my first time making cauliflower rice, and I really liked it. I made mine not spicy, by leaving out the sriracha. I also only had 4 cups of cauliflower, rather than 6, so I downsized other ingredients accordingly, and I added a sprinkle of garlic powder. The roasted sweet potatoes have a delicious cinnamon and paprika crust on them, and were snackable. 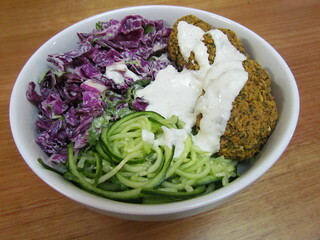 Cooling Cucumber Noodle & Baked Falafel Bowl with Tzatziki: It has been really hot here, so this was a nice and refreshing combination. I got three serves, rather than four, out of this. The falafel were excellent! They smelled so good and the taste did not disappoint. For the slaw, I left out the capsicum. I probably should have thrown some grated carrot in there to replace it, but it was still OK. The cucumber noodles were cool and refreshing. The tzatziki is based on cashews, which was nice. Overall for a dinner I just found it needed a bit more substance. I wish I had some pita bread to add, as suggested by the book. 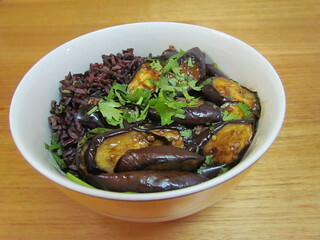 Spicy Chile-Garlic Eggplant and Black Rice: You know I left out the spicy chile part and just made this garlic. I had one and a half times the amount of eggplant needed, which made enough for four people. I doubled the sauce, because we like things saucy. Because I had a lot of eggplant, there was too many slices to cook all at once in the pan. So I cooked them in batches, then added the sauce to the empty pan to heat and thicken, and then added the eggplant back in. 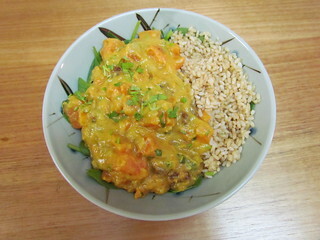 Swift Sweet Potato Coconut Curry: This is seriously delicious. You will want more! Instead of using a 400mL tin of full-fat coconut milk, I used a 270mL tin of light and 130mL of water, which made it just creamy and coconutty enough for me without the unfortunate coconut fat issues I get. I also only used 1 tsp of mild curry powder, rather than 1 TBS. I like it mild. I did need to simmer for a bit longer than noted in the recipe to get it to thicken up enough. This made two to three servings, but you could easily bulk it up by adding some chickpeas. Or just double the recipe... or triple it... it is so great you will want lots of leftovers. I miss Sahara so much. It is pretty hard to come back to blogging about regular things after everything that has happened. 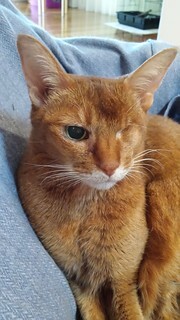 I just want to thank everyone for all their kind words, and all the support you gave during Sahara's illness. It is still surreal that she is gone, and I wish that time would just stop for a while. But it keeps on going and dragging me along with it. 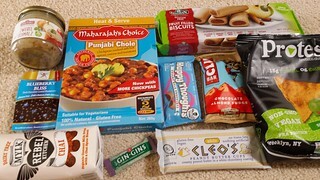 I guess a post about the latest Cruelty Free Shop Vegan Mystery Box is a gentle way to ease back into a bit of blogging. Veggie Street Onion Lard: This product intrigues and baffles me. Miraculously it is not based on coconut oil, so it is something I can eat. Apparently it is traditionally served as a spread for bread in pubs, but you can also use it for cooking, baking and frying. They have included a recipe for Hungarian Goulash that uses it. The first time I have been glad for a recipe inclusion! Cleo's White Chocolate Peanut Butter Cups: I am adamantly opposed to white chocolate. They shouldn't even be allowed to call it chocolate. Someone will be getting a gift! Protes Spicy Chilli Lime Chips: I was nervous that these would be too spicy for me, so I shared them with my mum. They are not spicy, in fact they have almost no taste except the overwhelming bitterness of the pea protein in them. Gross, would not recommend. Rebel Kitchen Chai Coconut Milk: Happily, I can drink this milk without any coconut fat fall out. This is good, because it is good stuff! I have tried the chai before, and it is not bad. I prefer the chocolate or the kid-sized choc/orange and choc/banana flavours. Chocolate Yogi Happy Thoughts Chocolate: Apparently this tastes like milk chocolate, so we shall see. Everyone knows I like my chocolate dark, bitter and angry with the world. Maharaja's Choice Punjabi Chole: Unfortunately this is designated as hot. 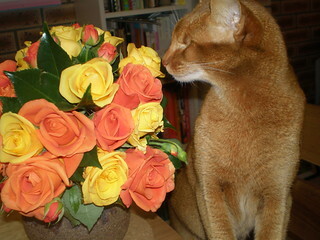 And having tried one of their mild-medium varieties, I have given this to my dad who can tolerate more heat than I can. 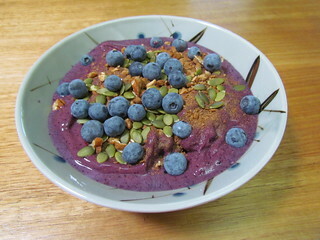 Dr Superfoods Super Blueberries: These were OK, though the blueberries were kind of lost in the chocolate coating. Orgran Apple & Cinnamon Filled Biscuits: These are pretty sweet, but have been a good afternoon pick me up at work! Clif Bar Choc Almond Fudge: My favourite flavour of Cliff Bar is just the straight up Peanut Butter. I suspect this will be quite sweet and rich, though my mother is very curious to try it. Gin Gin's Chewy Ginger Candy: I do like having a ginger chew on hand for emergency sugar lows or nauseous tummies, so this is in my handbag ready to be called upon. Overall, I was a bit meh on the contents of the box this month. Which is largely to do with my own personal preferences for things. Dim Sim is an only cat now. This makes her very content. At least someone can be, I guess. This is a really hard post to write, even though most of you will already know about this from Twitter and Instagram. 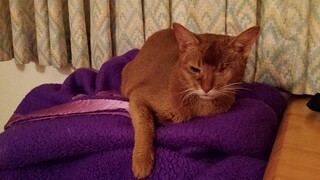 Following on from my last post, Sahara never got to surgery to have the sarcoma removed. She had a bit of an off weekend, so I took her in to the clinic on the Monday. 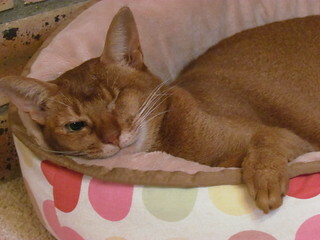 Blood results showed that she was in kidney failure. 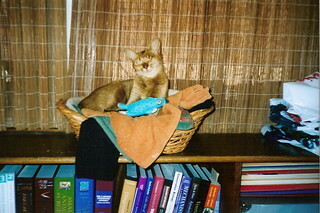 An ultrasound the next day showed that she also had massive pancreatitis. She was in hospital for four days, with a few small improvements, but on Friday the 17th of February she had a seizure. The chances of her recovering were almost hopeless, and I had to let her go. I first met Sahara in May of 2003. 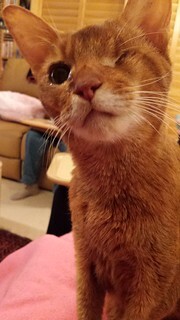 She was 18 months old, and her then person was moving into a retirement village that didn't allow for cats. She needed someone to adopt her. I had to go and have a meeting and interview first. I drove from Sydney to the Blue Mountains, and was greeted by this sleek, little red cat with one eye, curiously watching me from underneath the car in the driveway. 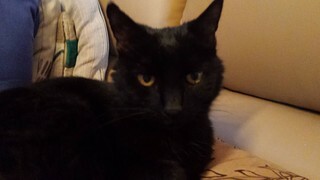 Obviously the meet and greet was judged a success, and I was deemed suitable, and the next day Sahara came to live with me and her new sisters (Gizmo was cool with it, Dim Sim was unimpressed). Sahara was a force of nature. She was curious, intelligent and extremely enthusiastic about everything she did. She was always interested in people as well, and would come and say hello to everyone who visited. 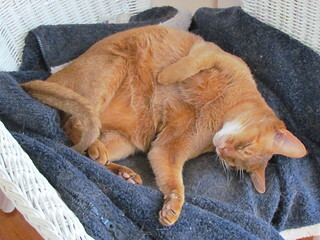 Often inserting herself onto a chair (or lap) at the table or the sofa. Just over four years ago, she was diagnosed with severe IBD, that ended up needing to be controlled with both corticosteroids and immunosuppressive drugs. She also developed arthritis in her elbows, which slowed her down and limited her play. But nothing ever limited her sweet little spirit. She still loved to be everywhere and with everyone. She was got the nickname 'Bear' because she loved to give big bear hugs, and enjoyed being held like this for what we called 'cuddle walks'. 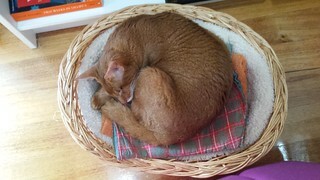 She made herself multiple beds in every room of the house, not just the actual cat beds we gave her, and I don't think there is a chair or a surface or a bed that she didn't make herself at home on at some point. If you left anything soft lying around, she would be on it. Oh yes, and she LOVED broccoli. She would steal it right off your plate if you weren't careful. 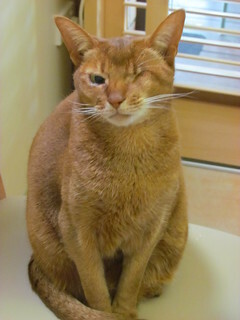 The beginning of the end, she was diagnosed with lymphoma (a type of cancer) in her colon at the beginning of the year. She started chemo. She went into remission, however then got too sick in other ways. I just struggle to understand. The chemo was working, why couldn't that be that. Why all the other things? I guess I can't ever know, but I can't help but feel that I let her down somewhere along the way. So now it is just me and Dim Sim. 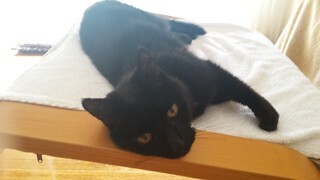 Dim Sim is loving it, she has wanted to be an only cat for so long, and finally she can live her best life. As for me, I'm devastated. Also adrift. Sahara organised our days around her. She had several set feeding times, which she would remind you of like clockwork. She needed her meds. She would wake me up with a paw and a purr and a meow (and occasionally a love nip) before my alarm because she thought that it was time I was up and feeding her. The empty space she has left behind is huge. I have so much more I feel I should say about her, words will never be enough. 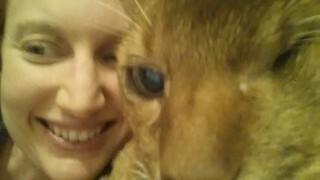 Goodbye my sweet little bear. Thank you for loving me, and being mine, and letting me be yours.